Postpartum tubal sterilization is an effective permanent contraceptive option for women whether it is performed by partial salpingectomy, electrocoagulation, or the use of rings or clips. This procedure can be performed at the time of cesarean delivery or shortly after a vaginal delivery. It should not prolong a patient’s hospital stay. Some background information is provided below. Tubal sterilization remains the most common contraceptive method for women older than age 35 years, although oral contraceptive use superseded tubal sterilization as the leading method of contraception in the United States in 2002. Worldwide and in the United States, the most common surgical approach for postpartum tubal sterilization is by infraumbilical minilaparotomy. With the fundus at the level of the umbilicus immediately postpartum, the fallopian tubes are usually easily accessed from this entry point. Bilateral tubal ligation may also be performed after hysterotomy closure at the time of cesarean, but this article will focus on the postpartum approach within 48 hours following a vaginal delivery. Postpartum tubal sterilization is indicated in any patient who is medically stable after a vaginal delivery (usually within 48 hours) and desires permanent contraception. The patient should have been properly counseled about the procedure (see Patient Education and Informed Consent). Consideration must also be given to regulations regarding timing of consent  and adequacy of staff to perform an elective procedure. Procedure planning and complication prevention are briefly discussed below. It is critical to correctly identify the fallopian tube before ligation or clip application. In situations in which visualization is difficult, Trendelenburg and lateral tilt positions may help as well as the use of small laparotomy sponges. 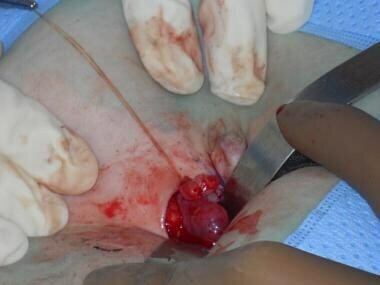 When performing a postpartum modified Pomeroy tubal ligation, holding one suture long before excision of the tubal portion prevents retraction of the tube back into the abdomen before hemostasis can be assessed and the tubal ostia visualized. 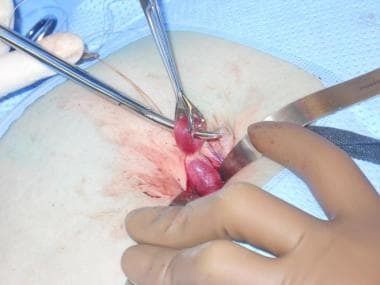 The Filshie clip system is an alternative to partial salpingectomy in the postpartum setting, particularly useful in difficult surgical cases (eg, obesity, intra-abdominal adhesions). [6, 7] A randomized controlled trial published in 2012 showed, however, that the titanium clip was not as effective as partial salpingectomy in the postpartum setting. Through 2 years of observation, the pregnancy probability for the clip group was 0.017 compared with 0.004 for the partial salpingectomy group (P = 0.04). However, this study was limited by a high loss–to–follow-up rate (just over 50% for both groups) and a limited follow-up period (24 mo). Increased edema and hypertrophy of the fallopian tubes in pregnancy are thought to be responsible for this difference in effectiveness. Complications of minilaparotomy are typically minor, including wound infection and incisional hernia formation. To avoid the minor wound infection that may occur following surgery, a thorough preoperative skin preparation with an antiseptic solution must be performed. There is no indication for preoperative antibiotic prophylaxis for the procedure. 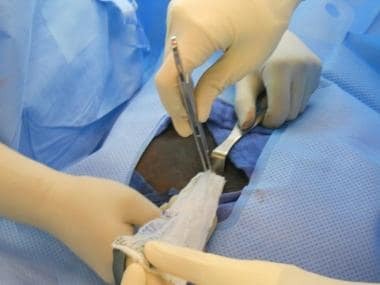 To decrease the risks associated with difficulty in locating abdominopelvic structures, the surgeon must assess the level of the fundus before the start of the procedure to ensure the adnexa is adequately accessible. Failure rates at 12 months poststerilization and major morbidity are rare. A common reason for sterilization failure is ligation of the wrong structure, typically the round ligament. Therefore, careful identification and isolation of the fallopian tube before ligation is necessary. Furthermore, if a tubal segment is excised, pathologic confirmation is an important step, when available. The patient is placed supine on the operating table. The bladder should be drained before the procedure to ensure that the fundus is not displaced too far above the umbilicus by a distended bladder. After the patient has been surgically prepped and draped and adequate anesthesia has been confirmed, a 2-3 cm infraumbilical semilunar or vertical incision is made. Elevating the skin with Allis clamps may help accomplish this (see the following image). Further dissection through the subcutaneous tissue may be done with a Kelly clamp or hemostat down to the level of the fascia. Once visualized, the fascia is grasped and elevated with 2 Kelly or Kocher clamps and incised with Mayo scissors. The opening in the fascia should be approximately the same size as the skin incision. The underlying parietal peritoneum is then grasped with 2 hemostats, elevated and cut with Metzenbaum scissors. Two small retractors are then placed in the incision and the fundus identified. Army-Navy retractors (see the image below) are firmer and easier to manipulate, but in some instances, such as when the subcutaneous layer is thicker, small S-shaped retractors may be more effective. Using the 2 retractors, one operator then pulls the surgical opening in the direction of the adnexa, whereas the second operator is prepared to grasp the fallopian tube once visualized with a Babcock clamp. If visualization is difficult, lateral tilting the patient toward the opposite side may help. If omentum or bowel is obscuring visualization, small, moistened laparotomy packs (see the following image) may be placed through the incision with Singley forceps using a sweeping motion over the fundus to displace bowel and omentum cephalad. These packs should be tagged. Packing with a small laparotomy sponge. Once the fallopian tube is visualized, it is carefully grasped with the Babcock clamp and gently elevated through the incision, as shown in the image below. The tube should then be followed to its fimbriated end in a stepwise fashion with either another Babcock clamp or the Singley forceps to ensure that the correct structure has been identified. Elevation of the fallopian tube through the incision. Tubal occlusion may be performed using the modified Pomeroy method, the Parkland method, or, in limited cases, the Filshie clip device. The fallopian tube is then followed back to the mid-isthmic portion, and a loop of tube is elevated with the Babcock clamp. 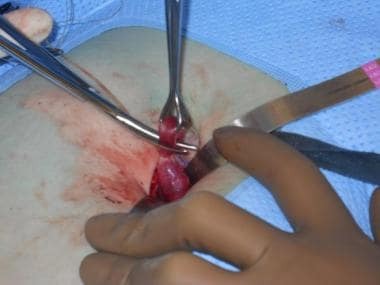 The base of the loop is ligated with 2 ties of 2-0 plain gut suture, holding one suture long with a hemostat to avoid retraction of the tube back into the abdomen after transection (see the image below). Ligating the fallopian tube in the mid-isthmic region using 2-0 plain gut suture. Next, a window is created bluntly in the mesosalpinx within the loop using the tips of the Metzenbaum scissors (see the first image below). 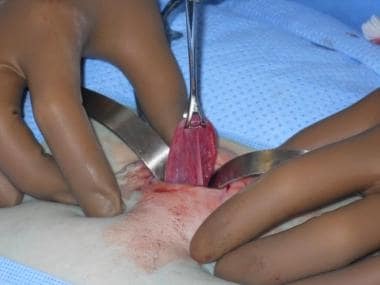 Each limb of the tube is then individually cut, leaving an adequate tubal stump proximally and distally to ensure that the cut ends do not slip through the suture (see the second image below). Piercing the mesosalpinx with Metzenbaum scissors. Excising the tubal segment. 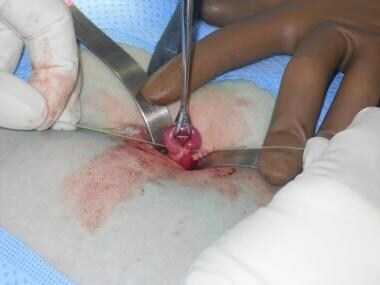 Note that the tube is being held by a hemostat to avoid retraction into the abdomen after complete excision. The tubal segment is routinely sent to surgical pathology for confirmation. While holding onto the hemostat, the cut ends are inspected for the presence of tubal ostia both proximately and distally as well as hemostasis (see the following image). 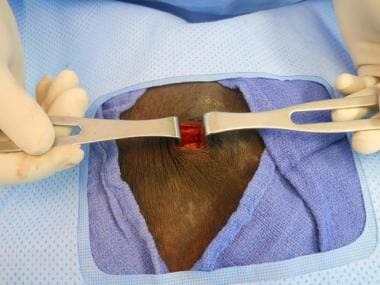 Tension on the suture should be released when observing for hemostasis. The tube is then released back into the abdomen. 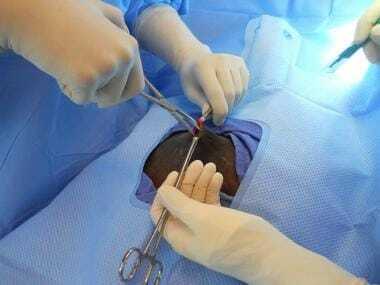 This procedure is then repeated on the remaining side. Visualizing the cut ends of the fallopian tube. In some circumstances, tubal occlusion by the Parkland method may be appropriate, usually when there is excessive tension on the loop of tube that makes it more likely that the cut ends would slip out of the suture once excised. The fallopian tube is identified and grasped in the mid-isthmic portion as above. An incision is made in an avascular window of the mesosalpinx below the tube with Bovie cautery or Metzenbaum scissors. A 1-2 cm portion of tube is then ligated proximately and distally with chromic suture, and the tubal portion is excised with Metzenbaum scissors. Again, one suture should be held long until hemostasis is assured and the tubal ostia identified. After proper identification of the fallopian tube as above, the tube is followed back to approximately 1-2 cm from the cornua. Using the Filshie applicator designed for laparotomy, the clip is placed in the applicator and the jaws of the clip are opened and advanced around the tube at an angle perpendicular to the tube until the lower jaw of the clip is seen through the mesosalpinx, assuring the entire tube is within the clip. The clip is then slowly applied to the tube using gentle but firm pressure on the finger bar until the stop is reached. Pressure is then slowly released, leaving the clip in place on the fallopian tube. Caution must be taken to avoid lacerating the tube or tearing the mesosalpinx. Next, attention is turned to the remaining side, and the above steps are repeated. Of note, especially edematous tubes are not appropriate for this method. The risk of complication with postpartum minilaparotomy and tubal ligation is low. As with all surgery, there is some risk associated with anesthesia. These risks are generally low, but they depend on the method and route of anesthesia used. Some of the most serious complications occur during entry into the abdomen. A patient with a history of abdominal surgery or pelvic infection may be at greater risk of complication upon abdominal entry and result overall in a more difficult surgery. Additionally, care must be taken with the tube during the procedure, as excessive traction on the fallopian tube can lead to mesosalpingeal tearing or tubal laceration leading to intra-abdominal hemorrhage. Before the start of the procedure the surgeon must assess the level of the fundus, ensuring the adnexa is adequately accessible. This will aid in decreasing risks associated with difficulty in locating structures. Counseling for postpartum tubal sterilization is critical and should occur before the intrapartum period. Patients should be made aware that tubal sterilization is more effective than user-dependent methods but comparable to intrauterine devices and vasectomy. Postpartum tubal sterilization is associated with higher regret in women younger than 30 years. Other contraceptive options, both permanent and nonpermanent methods, should be reviewed with the patient, and consideration should be given to other comorbidities (eg, obesity, previous abdominal surgeries, history of pelvic inflammatory disease [PID]) which could complicate the procedure. A basic laparotomy tray includes hemostats; Kelly, Kocher and Allis clamps; Metzenbaum and Mayo scissors; a needle driver and small tissue forceps; and a scalpel. See the following image. 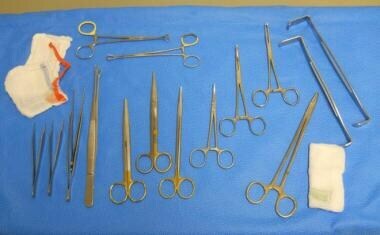 Instruments for postpartum sterilization by minilaparotomy. Anesthesia considerations and patient positioning are included in patient preparation for the procedure. The American Society of Anesthesiologists Task Force on Obstetric Anesthesia published recommendations for anesthetic choice for postpartum sterilization in their Practice Guidelines for Obstetric Anesthesia. In most patients, tubal sterilization can be performed safely within 48 hours of delivery, either by epidural, spinal, or general anesthesia. Patients should be placed on the operating room table in the supine position with their arms extended out to the side. Trendelenburg positioning may help with displacement of the bowel superiorly for enhanced exposure. Additionally, to aid in visualization, the patient can be placed in slight right lateral tilt when attempting to identify and ligate the left fallopian tube; when the surgeon is operating on the right fallopian tube, the patient can be placed in a left lateral tilt. Lawrie TA, Kulier R, Nardin JM. Techniques for the interruption of tubal patency for female sterilisation. Cochrane Database Syst Rev. 2015 Sep 7. 9:CD003034. [Medline]. Chan LM, Westhoff CL. Tubal sterilization trends in the United States. Fertil Steril. 2010 Jun. 94(1):1-6. [Medline]. Garcia G, Richardson DM, Gonzales KL, Cuevas AG. Trends and disparities in postpartum sterilization after cesarean section, 2000 through 2008. Womens Health Issues. 2015 Aug 29. [Medline]. Powell CB, Alabaster A, Simmons S, Garcia C, Martin M, McBride-Allen S, et al. Salpingectomy for Sterilization: Change in Practice in a Large Integrated Health Care System, 2011-2016. Obstet Gynecol. 2017 Nov. 130 (5):961-967. [Medline]. Wolfe KK, Wilson MD, Hou MY, Creinin MD. An updated assessment of postpartum sterilization fulfillment after vaginal delivery. Contraception. 2017 Jul. 96 (1):41-46. [Medline]. Kohaut BA, Musselman BL, Sanchez-Ramos L, Kaunitz AM. Randomized trial to compare perioperative outcomes of Filshie clip vs. Pomeroy technique for postpartum and intraoperative cesarean tubal sterilization: a pilot study. Contraception. 2004 Apr. 69(4):267-70. [Medline]. Penfield AJ. The Filshie clip for female sterilization: a review of world experience. Am J Obstet Gynecol. 2000 Mar. 182(3):485-9. [Medline]. Rodriguez MI, Seuc A, Sokal DC. Comparative efficacy of postpartum sterilisation with the titanium clip versus partial salpingectomy: a randomised controlled trial. BJOG. 2013 Jan. 120(1):108-12. [Medline]. Hillis SD, Marchbanks PA, Tylor LR, Peterson HB. Poststerilization regret: findings from the United States Collaborative Review of Sterilization. Obstet Gynecol. 1999 Jun. 93(6):889-95. [Medline]. Thurman AR, Janecek T. One-year follow-up of women with unfulfilled postpartum sterilization requests. Obstet Gynecol. 2010 Nov. 116(5):1071-7. [Medline]. Schorge J, Schaffer J, Halvorson L, Hoffman B, Bradshaw K, Cunningham F. Contraception and Sterilization. Williams Gynecology. McGraw-Hill; 2008. 129-131. Rock JR, Jones HW. Tubal Sterilization. Te Linde's Operative Gynecology. 10th ed. Philadelphia: J.B. Lippincott; 2008. 609-628. Peterson HB, Xia Z, Hughes JM, Wilcox LS, Tylor LR, Trussell J. The risk of pregnancy after tubal sterilization: findings from the U.S. Collaborative Review of Sterilization. Am J Obstet Gynecol. 1996 Apr. 174(4):1161-8; discussion 1168-70. [Medline]. ACOG Practice Bulletin No. 46. Benefits and Risks of Sterilization. September 2003. Peterson HB, Jeng G, Folger SG, Hillis SA, Marchbanks PA, Wilcox LS. The risk of menstrual abnormalities after tubal sterilization. U.S. Collaborative Review of Sterilization Working Group. N Engl J Med. 2000 Dec 7. 343(23):1681-7. [Medline]. American Society of Anesthesiologists Task Force on Obstetric Anesthesia. Practice guidelines for obstetric anesthesia: an updated report by the American Society of Anesthesiologists Task Force on Obstetric Anesthesia. Anesthesiology. 2007 Apr. 106(4):843-63. [Medline]. Bucklin BA. Postpartum tubal ligation: timing and other anesthetic considerations. Clin Obstet Gynecol. 2003 Sep. 46(3):657-66. [Medline]. White K, Teal SB, Potter JE. Contraception after delivery and short interpregnancy intervals among women in the United States. Obstet Gynecol. 2015 Jun. 125 (6):1471-7. [Medline]. Moaddab A, McCullough LB, Chervenak FA, et al. Health care justice and its implications for current policy of a mandatory waiting period for elective tubal sterilization. Am J Obstet Gynecol. 2015 Jun. 212 (6):736-9. [Medline].